The Chapel of the Nativity was given by the Constable family, founders of the Arnold Constable department store. The windows and the altarpiece were purchased from a private family chapel in England. Kempe also made the Great West Window in the church. C.E. Kemp (1837-1907) came from a well-off family; his uncle was a successful property developer and politician in nearby Brighton, and his grandfather was Lord Mayor of London, according to British Express. He considered the priesthood, but his severe stammer which was an impediment to preaching. 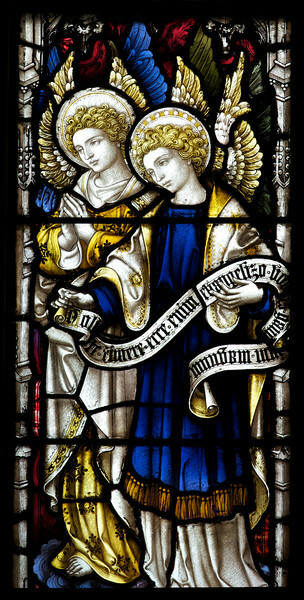 Instead Kempe decided that "if I was not permitted to minister in the Sanctuary I would use my talents to adorn it", and subsequently went to study architecture with the firm of a leading ecclesiastical architect George Frederick Bodley, where he learned the aesthetic principles of medieval church art particularly stain glass, according to Wikipedia. From Britain Express: “Kempe travelled around Britain and overseas, sketching medieval window designs. Kempe assisted Bodley on two major church projects in the 1860s; All Saints, Cambridge, and St John's, Liverpool. In 1866 the important stained glass makers Clayton and Bell asked Kempe to design a memorial window for Bishop Hooper in Gloucester Cathedral. In 1866 he started his own business in London. Kempe Studios began by supplying vestments, stained glass, and church furnishings. The studio was a success, and enjoyed continual growth throughout the late Victorian period. You could say that he was fortunate, for Kempe Studios began in a period when church architecture and rebuilding was in vogue; the spiritual Renaissance of the Victorian period led to many medieval churches being rebuilt. So suppliers of materials and architectural knowledge were in great demand, and Kempe's work, particularly with stained glass, found a ready market of buyers. Kempe decided early on that he needed to use a trademark, and he chose a wheatsheaf, which appears in the Kempe family coat of arms. Finding the wheatsheaf in a set of Kempe windows is a strangely enjoyable pastime for people who enjoy exploring Victorian churches! Kempe was especially active in his native Sussex, where fully 116 churches boast examples of his work. He did not just deal in stained glass, though it is for glass that Kempe is best known. Some of his most important work was with wall painting, such as that at Staplefield, outside Horsham, West Sussex. Aside from the wheatsheaf trademark, one of the characteristic features of a Kempe design is a strong predominence of yellow. Kempe's designs - particularly those in stained glass - helped define the style of an age, closely associated with the artwork of the Pre-Raphaelites. When you see a Victorian stained glass window, with its clear, clean colours and romanticised figures, you may not be seeing a Kempe design, but you are almost certainly seeing a design influenced by Kempe. Kempe died in 1907, and his company was taken over by WE Tower. But Tower did not enjoy the same success as Kempe, and the company folded in 1934. Kempe studios produced over 4,000 stained glass windows.